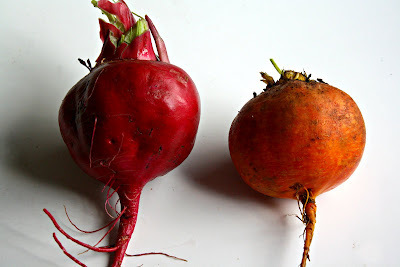 Why can't I make a turnip (left) taste as good as a beet (right)? At Wickham Farms, where I work, I regularly talk to our CSA members to get feedback about their experience with the program. A comment I hear often is that members enjoy getting lots of different veggies, because it has expanded their culinary repertoires. The trick, of course, is knowing how to cook these items, and it’s part of my job to help our CSA members in this area. Each week, I cook a recipe that incorporates our CSA veggies for sampling. I favor recipes that are uncomplicated and incorporate unusual items. This week, for example, the recipe was a cole slaw that included Daikon radishes and kohlrabi. I have just one Achilles heel in this position -- turnips. I just haven’t found that special recipe that’s made me say “yum.” Last week, I tried this recipe for roasted root vegetables with an apple cider glaze. I used beets and turnips, and the beets turned out great, but the turnips just didn’t do it for me. I thought I’d turn to my friends in cyberspace for help. Do you have any tips for cooking turnips? What’s your favorite turnip recipe? This also was published in my blog on Flavors of Rochester.